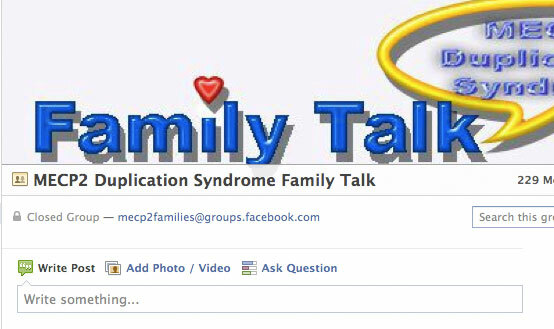 MECP2 Duplication Syndrome Family Talk is a Facebook group for family members of individuals with MECP2 Duplication Syndrome to discuss topics of common interest. Membership in the group is limited to family members, but anyone who is a family member of someone with MECP2 Duplication Syndrome is welcome to join the group. The MECP2 Duplication Syndrome Family Talk Group connects 100s of families from around the world. There are also some related groups with more specific focus. The UK MECP2 Duplication Syndrome Support Group connects families in the United Kingdom. Duplication MecP2 France connects families in France and also Francophones from various other countries. Le syndrome de Duplication MECP2 famille Groupe Discuter connecte 100s des familles de partout dans le monde. Il ya aussi certains groupes connexes en mettant l’accent plus spécifique. Le Royaume-Uni MECP2 Duplication Groupe de soutien du syndrome relie les familles au Royaume-Uni. Duplication MeCP2 France relie les familles en France et aussi les francophones de divers autres pays. In order to join the group you need to be a Facebook user. If you are not a Facebook user, consider joining, even if you only use it for the MECP2 Duplication Syndrome Family Talk group. If you have been invited by another group member, you can just click on the link to the group in the invitation. The red arrow on this illustration points to the response box. If you received an invitation from another group member it will say Respond to Group Invitation. If you got here on your own, it will say Ask to Join Group. Either way, click on this box to join the group. Your membership request requires approval by a group administrator. This is necessary to avoid people who join groups to post junk, scams, and commercials. It also helps limit our group membership to family members. Here is how the approval process works. A group administrator looks at your name and if necessary your public profile Facebook page, this is often enough to make it clear that you are a family member. If not, the group administrator may contact you asking for more information. Please note, we define family in a broad sense, so if you feel like a family member you probably are. PROBLEM WITH REQUEST? This step is important, but it is the one that seems to be most difficult in some cases. Occasionally, someone asks to join, but the group administrator cannot contact him or her. This usually happens because the person requesting membership has set tight privacy settings that do not allow anyone to send messages unless they are Facebook friends. If you experience a problem with this, you do not need to change your settings if you want to keep your privacy. Instead of doing that you can use the contact form to reach an administrator via e-mail. Any member can post to the group. You can post on an existing topic or start a new one. The top of the page should look something like the illustration below. You can write a message in the “write something” window and hit the “share” button, just like posting anything else on Facebook, it will be posted on the group Wall. For discussions on a specific topic or for starting a new topic click on the “Discussions” tab. This takes you to a new window that lists discussion topics. It should look something like this. Click on any discussion topic of interest to see what has been posted and to reply or add your own comments under that topic. Click on the “Start New Topic” button to initiate a new topic. For now the primary language discussion will be English. However, if any users prefer to use another language, your posts are also welcome and we will try to provide translation to English via Google Translator software. Post anything that you feel will be of interest to other group members. Please do not post any disrespectful or libelous content. I was happy to try to start this group off, but we are all partners in this group. It belongs to all of us. The most important thing any of us can do to help is use the group, but you can also help by letting other family members know about the group, and by sharing your opinions on how we can make the group better. I also need to ask for your patience. I will try to make this group what all of its members want it to be, but I am learning how to do this as I go. Hi, My son Bentley was diagnosed with MECP2 last month. I’ve requested to join the family talk however I’m still waiting to be accepted into this group. Hi Amanda, Sorry for the mix up. I confirmed your membership in the MECP2 Duplication Syndrome Family Talk Group. I did see your request to join and sent a Facebook message to you on February 6th asking you to confirm your family connection. Unfortunately, these messages can easily get overlooked because you have to look under the message menu at “other”. Glad you contacted me this way to let me know, and WELCOME to the group. We live in Edmonton, Alberta, and our son who has MECP2 Duplication Syndrome is 25 years old. Thank you. I just confirmed your membership in the Facebook group.